Product description: About 20cm. in dia and 45mm. wide turned and carefully balanced, mounted on a horizontal shaft, held in ball bearings.The wheel is marked and pointer is fixed to the bracket.The bracket has four holes and can be fixed to the wall. Comprising an iron flywheel 115mm diameter, mass 1.2Kg, mounted in cast brackets with nylon bearings. 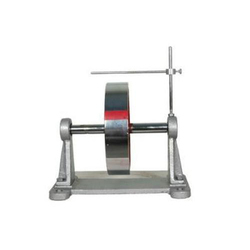 The shaft has an aluminium V pulley 44mm diameter, for driving with the spring belt. 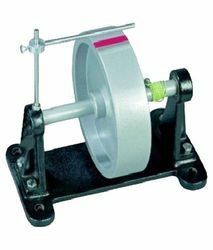 NSAW FLY Wheel 8" with Counter.A flywheel is a rotating mechanical device that is used to store rotational energy. The amount of energy stored in a flywheel is proportional to the square of its rotational speed. Due to this relationship, Flywheels make excellent instruments for experimentation on Moment of Inertia. These are fabricated using optimum quality material and are available in various sizes and shapes. Our range is precisely engineered to meet the requirements of our clients. The unit is the component part of the clear demonstration of the conversion of electrical energy into kinetic energy and back again when used in conjunction with the motor units and the lamp unit.